We’ve already gone over the basic recipe for minestrone on this blog. Once you’ve mastered that, it is a lot of fun to explore the many varieties of minestrone from all over Lo Stivale (meaning ‘the boot’ one of the many nicknames Italians give to their country). 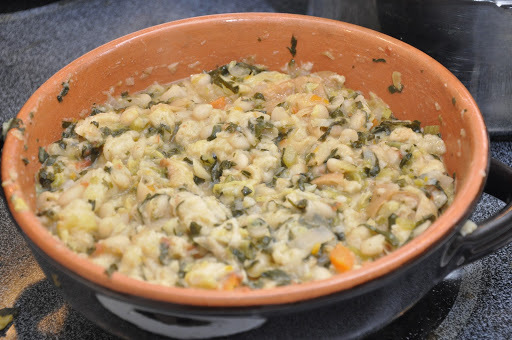 Perhaps the most delicious version of all is the Tuscan classic called la ribollita, or ‘re-boiled’ because it is made ahead, layered with bread in a pot (preferably made of terracotta) and reheated before serving. Like any minestrone, it tastes so much better the day after—or even after a few hours—and the bread gives it a special flavor. Make your minestrone, using the above ingredients, following the master recipe. 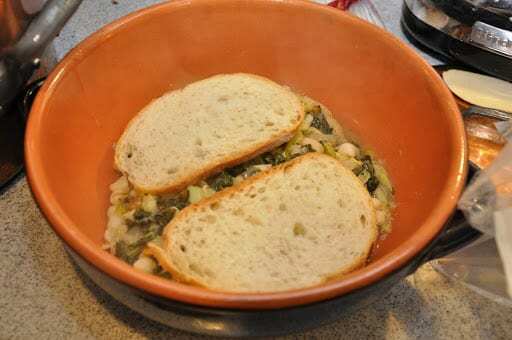 When the soup is done, place some slices of bread in the bottom of a good-sized terracotta casserole or soup pot (if you don’t have a terracotta cooking vessel, the enameled cast iron or, in a pinch, a regular soup pot will do). Then ladle over a good portion of the soup. Add another layer of bread, then another layer of soup, and so on, until you have filled the pot or used up your ingredients. End with a layer of soup. Let the soup rest for several hours or overnight. When you are read to eat, gently re-heat the soup. As the soup heats up, mix it up with a wooden spoon, which will break up the bread and mix it in with the rest of the ingredients. The result will be very thick, almost more a stew than a proper soup. Serve when nice and warm, drizzled on top with un filo d’olio and, if you like, some freshly ground black pepper. The number or types of vegetables vary quite a bit from recipe to recipe, but the two essential ingredients—typically Tuscan—are the cannellini beans and the cavolo nero, or black kale, also marketed as lucinato kale or Tuscan kale. I have even seen a recipe that called it ‘dinosaur’ kale—not sure where that came from! Once impossible to find, I am happy to report that I now find black kale pretty regularly at my local supermarket here in the US. 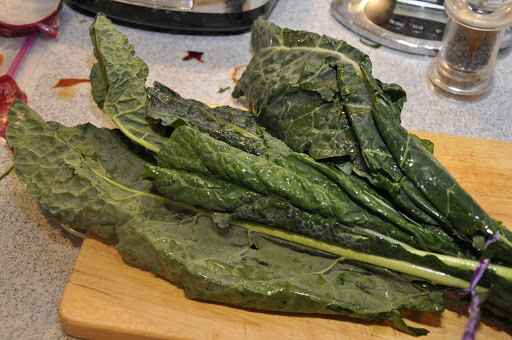 Similar in flavor to other sorts of kale, it has long, rather slender dark-green (not literally black!) leaves. Black kale is much more tender and has a more subtle taste. To use it in the soup, you need only to remove the central stem, which can be very tough, then roll it up and shred it with a sharp knife. Other leafy greens, like Savoy cabbage or Swiss chard (or even beet greens) add a nice variety but can be omitted if you don’t have them on hand, as can the leek, another vegetable used more frequently in Tuscany than in most other parts of Italy. Another typically Tuscan touch is the use of red onion, which Tuscans seem to prefer, but of course yellow or white onions will do if you don’t have red onions on hand. The choice of bread is of utmost importance. If you have Tuscan bread around, that is, of course, the best choice. Failing that, any well-structured bread that will stand up to cooking will do, although I would avoid sour-dough just because it has too strong a taste. Above all, avoid sandwich breads, which will turn to mush and give your ribollita an uncharacteristic texture. Ribollita is best when made the day before, but you can make it in the morning for dinner or even an hour or two before—although the longer it sits, the better. The texture is thick and hearty but not heavy, and the bread gives a flavor that is really something very special. Make your minestrone, using the above ingredients, following the master recipe (see Notes). When the soup is done, place some slices of bread in the bottom of a good-sized terracotta casserole or soup pot (if you don't have a terracotta cooking vessel, the enameled cast iron or, in a pinch, a regular soup pot will do). Then ladle over a good portion of the soup. Serve when nice and warm, drizzled on top with un filo d'olio and, if you like, some freshly ground black pepper. The master recipe for making minestrone can be found at: http://memoriediangelina.com/2009/09/26/minestrone-a-primer. It's gorgeous and I love soup in the winter. I just love the recipes on this blog. They are so simple and delicious. I never ate something like “la rimbollita” only the minestrone, but this is the kind of meal I like. Will certainly try it! I am loving this soup! Definitely going to try this and going to look at your previous post about minestrone. Thanks for sharing both. I hope you have a Happy Thankgiving! I love the all the variations you give for your recipes! And the background stories – wish there were more! Sign me up for a bowl. It's gorgeous and I love soup in the winter. Just the name makes me want to walk along the shore in Rapallo. You make me fall in love with Italy again every time I read your recipes. 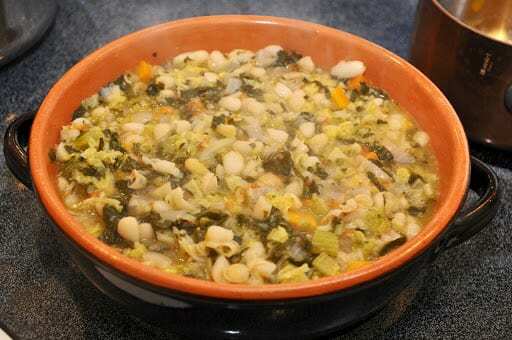 ribollita has always been one of my favorite soups to eat and to make! Thanks for sharing a wonderful recipe for such a tasty soup! Funny I had the same thing on my mind for today too! Love re-boiling it, need to go get some chard! Thanks for the inspiration! Very strange… I often plan to cook the same meals that you post at the same time! It must be a seasonal Italian roots thing! Just came home with a big bunch of fresh cavolo nero and swiss chard!